You are here: Home / Game Recaps / 2011 Game Recaps / BC Lions were on the brink of first win, then Alex came to town. BC Lions were on the brink of first win, then Alex came to town. The BC Lions just can’t get a break. 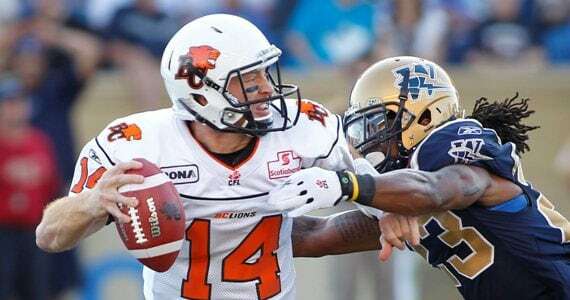 It also seems can’t they make one of their own and Thursday night in Winnipeg, the Lions dropped their 5th game in a row to remain winless in 2011, losing 25-20 to the Winnipeg Blue Bombers who moved to 4-1 on the year. The Lions had maybe their best performance of the season, but once again drops at key times and defensive breakdowns cost them the game. To add insult to injury they let Bomber backup QB Alex Brink drive 64 yards in the 4th quarter to give the Bombers the win. Brink entered the game in the 3rd quarter after Buck Pierce left with what appeared to be another concussion. The Lions defence had played well up until the Brink drive, going toe to toe with the best defence in the CFL. But when it counted the most, Ryan Phillips let Terence Edwards walk right by him over the middle, and the the seas parted for Brink who ran a QB draw up the middle for a huge gain. The drive ended with Edwards beating Davis Sanchez for the winning touchdown and the Lions failing to respond on their 2nd to final drive. BC were facing a 3rd and 10 with just over two minutes remaining but Lulay’s pass to Geroy Simon sailed onto the turf after Simon was blatantly interfered with by Merrill Johnson and no call was made. The Lions got the ball back with 28 second left on the clock but it was just a formality. The Bombers were playing on an emotional roller coaster after the passing of defensive line coach and former Lions coach Richard Harris to a heart attack earlier in the week. The two teams met at the middle of the field for a tribute to the popular coach prior to kick off. Both teams started slowly, but both Pierce and Lulay began to move their teams after the first quarter. The Lions took a 13-6 lead to the half after a great catch by Geroy Simon and a run by Jamal Robertson. Paul McCallum added a late field goal. But Winnipeg came out and took less than four minutes to take the lead. On their first drive, Bombers’ rookie slotback Clarence Demark caught an 82-yard reception, resulting in a Winnipeg touchdown. With 11:28 left in the third quarter, Justin Palardy connected with a 38-yard field goal giving the Bombers into the lead by a score of 16-13. Palardy connected with a 24-yard field goal, extending the Bombers’ lead to 19-14 after a McCallum single, and the Lions would manage two more field goals to take a one point lead. It was then time for Brink’s heroics. After the go ahead touchdown the Bombers failed to covert on their two point attempt after a delay of game penalty pushed them back to the 15 yard line, leaving the Lions down by five, but BC couldn’t generate anymore offence. The Lions must now look at making changes. It’s unlikely coaching changes will occur unless Wally Buono resigns, or David Braley has seen enough. However, Braley has been fiercely loyal to Buono and that seems unlikely at this time. With the team moving into a new BC Place stadium and hosting the Grey Cup this year, the season could not be off to a worse start. The Lions have yet to officially announce it but the club has signed DB Tad Kornegay who was released by Saskatchewan last week. With more secondary blunders it’s highly likely someone could be cut to make room for him. Dobson Collins may have run out of chances with three more drops and a dumb penalty for taunting. BC Lions centre Angus Reid tweeted “Sorry” to the fans after the game. If everyone had his effort and passion for the game, the Lions wouldn’t be in this spot. Travis Lulay continues to struggle at times, missing receivers at key times in the game. That said against the Bombers he was running for his life a lot. Winnipeg had six sacks to add to their league leading total, while the Lions had four. Lions fans can have the chance to checkout BC Place stadium this Sunday from 12:00-3:00pm. Enter at the west end of BC Place at Pacific Boulevard and Terry Fox Way. Next game: Friday, August 5th versus Saskatchewan Roughriders at Empire Field.